There are more than 1240 community pharmacies in British Columbia. What you may not know is far too many BC pharmacies are robbed with criminals stealing highly addictive and dangerous narcotics. Of these pharmacy robberies, 92% involve a weapon. In the first six months of 2014, there were more pharmacy robberies than in all of 2013, which puts pharmacy professionals, their patients and public safety at risk. The College of Pharmacists of British Columbia works to protect public health outcomes, and its Board was compelled to act. That's why DrugSafeBC was created. 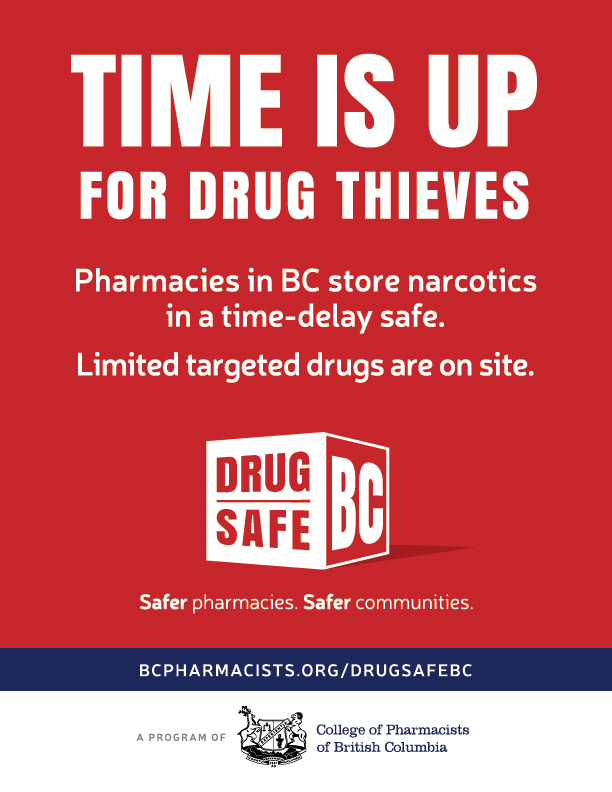 With DrugSafeBC, all community pharmacies in BC are required to have time-delay safes to store narcotic drugs as of September 15, 2015. The DrugSafeBC campaign features print, radio and television ads - we want to make sure that everyone knows about this important new security requirement. 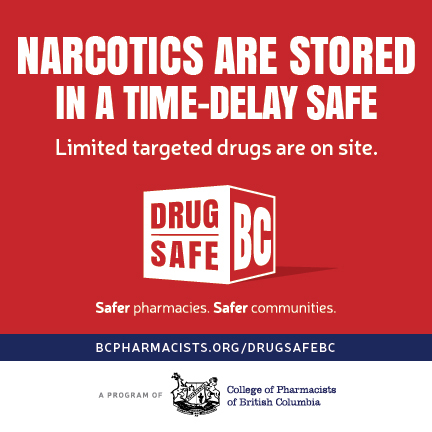 Through DrugSafeBC, we hope to achieve Safer Pharmacies. Safer Communities. Have a look at the DrugSafeBC campaign.